The team was recently featured in the Travel & Tourism section of a national paper last May discussing the motivations behind the adventure. 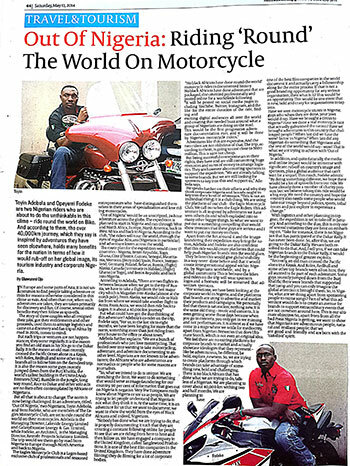 Out Of Nigeria (OON) is a motorcycle adventure themed socio-cultural corporate organization established in 2013 (though its executives have been operating for over a decade). It is an organization that brings together professionals from various disciplines with the primary goal of creating a positive change in the socio-cultural fiber of Nigeria and improving humanity across Africa in General. Enter the code: To use CAPTCHA, you need Really Simple CAPTCHA plugin installed.